is app allows store owner to combine the products and sell it as one single product. When bundling products, the app will allow only simple, configurable and downloadable product types without options. Product which are having options can't be added. Go to J2Store > Apps, find the Bundle Products app and click enable to activate the app. 3. Once enabled, you don't need to configure anything in the app. Just go to article manager and click new article. 2. 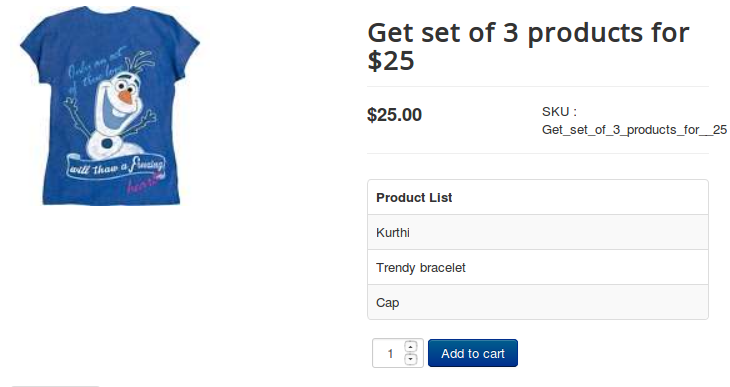 Select the product type Bundle Product and click save. 4. In general tab, choose YES to visible in storefront and navigate to apps. 5. Then navigate to several tabs (Pricing, Inventory, Images, etc) to add price, image, maintain stock. 6. Go to apps tab where you can see the search box to search for the products. 7. Type two or three characters of your product. 8. If the product you are searching for is not listed, the reason is that the product might be having options. Since this app allows only the product without options, the product with options cannot be added into the group. 9. Once the products are added, save article and check in the front end.